Young children love playing and find water relaxing. 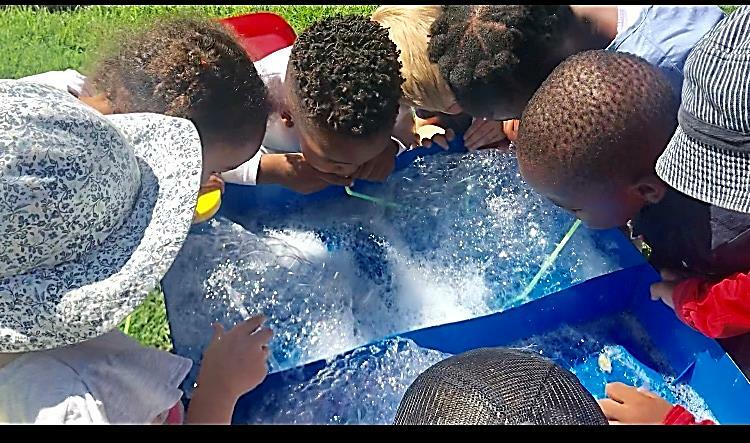 Water play provides hours of rich and valuable early childhood experiences to develop children’s creativity and imagination. Water play is both enjoyable and educational. It helps children develop eye-hand coordination and math and science concepts. It also enhances social skills and encourages cooperation. We had such fun at school this week by filling up our water table outside in the garden with water diluted with dish washing liquid. The children splashed the water with the dish washing liquid and eagerly took straws to blow endless bubbles. This kept the children occupied for a long period of time. They gleefully compared who blew the biggest bubbles! What a great water fun activity! All you need is water, straws and dishwashing liquid. A good idea for children’s birthday parties too!